Moderately challenging. There are three main climbs but none of them are partic­u­larly steep. 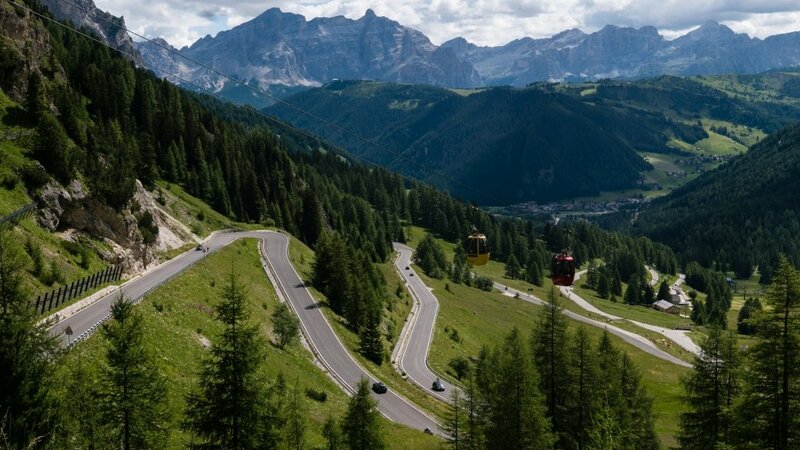 This section takes you into the Sella Ronda which is one of the main tourist magnets in the Dolomites. Most drivers and riders behave sensibly and treat the road, and cyclists, with respect, so don't let it put you off. The roads are clearly signposted. 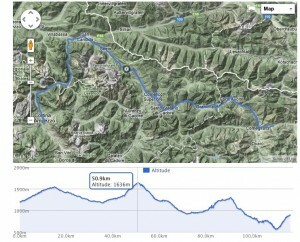 The route shown here takes the northern half of the Sella Ronda. You could opt for the southern half via Arabba and the Passo Pordoi. 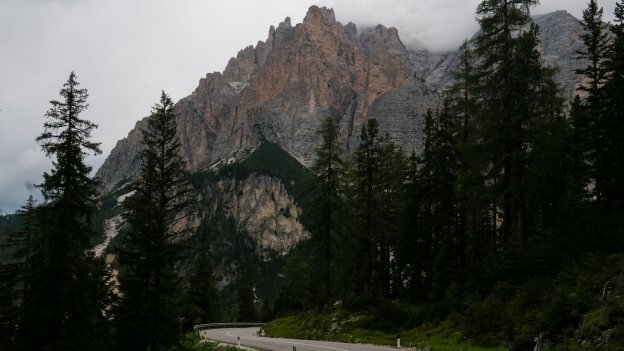 In 2017 the regional govern­ments for the Südtirol and the Trentino took the decision to close the Passo Sella, on a trial basis, on Wednesdays in July and August. The 'Green Days' were very contro­versial, and the results were a bit mixed: unsur­pris­ingly, part of the traffic was displaced from Wednesdays to other days, although, more posit­ively there was a signi­ficant increase in the number of people using the shuttle buses. It's not clear whether the closures will be repeated in 2018. A website was created for the 2017 Green Days (dolomitesvives.com) and it's probably the best place to check for news about closures in 2018. Update: in fact they went back to the drawing board and came up with a different approach: a pass system that sets a limit to the numbers of cars and motor­cycles that can go over the pass in any particular hour. Note though that the system doesn't operate at weekends. 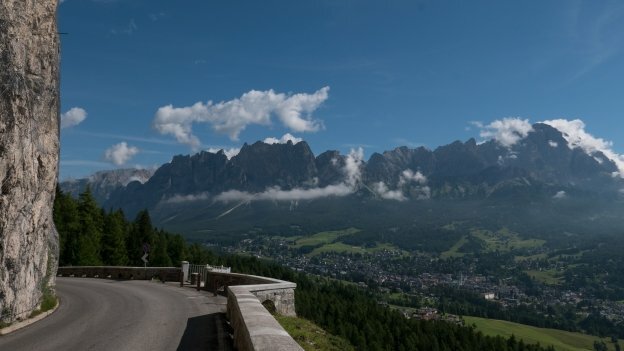 The route out of Cortina d'Ampezzo is dictated by the one-way system and your starting point. If you are starting in the centre of town, the shortest route is to find your way to the main square (the Piazza Angelo Dibona) and from there look for a street on the right-hand side of the Museo d'Arte Moderno. This brings you out onto the SS51, you then cross the road and pick up the Via del Parco. At the next junction turn right, following the sign for Falzarego. The road takes you over the Torrente Boite; on the other side of the river turn right (signs for Bolzano and Falzarego). If you are approaching from the north, there's another bridge over the Boite that means you can pick up the route without going into the centre of town. A few kilometres out from Cortina, you'll see the signs for a tunnel (the Pocol). Just before the tunnel, there is a fabulous panoramic viewpoint where you can pull over to take pictures. The tunnel is only 20 m long and carved out of the mountainside. It's one of the reasons why you won't see big trucks on this road. The tunnel is on a blind bend, so it's probably easiest, and safest, to stop before the tunnel and pull over, rather than waiting until after the tunnel and then having to take your chances with the blind bend. From the tunnel, the road climbs through woodland, which even at this altitude, could provide a bit of welcome bit of shade. On the climb from Cortina, you may notice a square tower on the valley side. This is the sacrario militare at Pocol. It contains the remains of 9,707 Italian and 37 Austro-Hungarian soldiers. Most died on the nearby Tofane massiccio during 1915. As you climb, you have the Tofane group on the right-hand side and in front, the Sella group and to the left, the Cinque Torri. Just after Pocol is the junction for the SP638 (which used to be the SS203) which leads to the Passo Giau and to the Marmolada. A little further on look out on your right-hand side for the Chiesetta degli Alpini. The little log chapel is a recon­struction of a chapel built for Italian troops serving on this sector of the front. At about the 1700m altitude mark the road levels out for a little bit. The scenery here is extraordinary: the Dolomites at their most majestic and impressive. Finally, you come to the Passo Falzarego (Fouzargo in Ladin) at 2109m. The name Falzarego comes from the Ladin fàlza régo — false king and is thought to refer to the legend of a usurper to the Kingdom of Fanes, who was turned to stone for having betrayed his own people. The pass cuts between two peaks: on the one side is the Lagazuoi (2835m) towering above you on the right-hand side. On the other side of the road is the Sass de Stria (2477m). There's a gondola (funivia /​seilbahn) that takes you almost the top of the Lagazuoi. This isn't the end of the climbing, but don't be in a rush to push on. In front of you, the road to Arabba and the Passo Pordoi forks off to the left and heads downhill. If the weather is good, you should be able to see the Marmolada with its glacier as well as the Lago di Fedaia below it. And then to the right the Sella group. Further down the road from the pass are the ruins of the medieval Castello di Andraz. There's then a little bit further to climb: the Passo Valparola (Jù de Valparola or Intrà i Sass in Ladin) is a wee bit higher at 2192m. On the way to the pass itself, you come to the remains of the fort that once guarded this pass which is now a museum about the 1914-1918 war. The fortress looks out towards the Marmolada. The fort was heavily bombarded by the Italian artillery and the Austro-Hungarian army was forced to abandon it. As you turn the corner there are more stunning views: stretching out before you is the Val Badia, with the Puez-Odle group in the distance, to the right is the Fanis group. The road then starts a dramatic descent down into the Val Badia. About 5 km from the Passo Falzarego the route crosses the border from the Veneto into the Südtirol, and the SP24 becomes the LS/​SP 37. This really is a dramatic descent: there are eight turnings, and each one brings a new OMG moment. It's the same mountain, but it constantly changes. The afternoon when I rode this, it had clouded over and was starting to rain, and as the clouds closed in around them, the mountains looked all the more moody and magni­ficent. The road gets a little less dramatic as it descends through San Ciascian (San Cassiano/​Sankt Kassian) and then La Ila (La Villa/​Stern) where you turn left and head for Corvara. After Corvara, the road climbs to the village ski resort of Calfosch. It's a pleasant place, and you can see the Sella group looming above you. The only problem is that the village itself continues for a kilometre or so before you can finally get to fully enjoy the view. After Calfosch the road climbs through a series of switch­backs up towards Ju de Frara pass (Italian: Passo Gardena; German: Grödnerjoch; also known in Ladin as the Jëuf de Frea). With each switchback, the Sella group seems to loom larger. While the Sella is the star of the show, views down into the Val Badia are glorious. There are more spectacular views as you crest the pass (2121m): to the right, there's the Puez group; straight ahead, the Saslonch (Sassolungo/​Langkofel); and to the left, the Sella group. A few more hairpin bends take you down from the pass, and then the road follows the base of the Sella itself. It climbs slightly before resuming its descent. 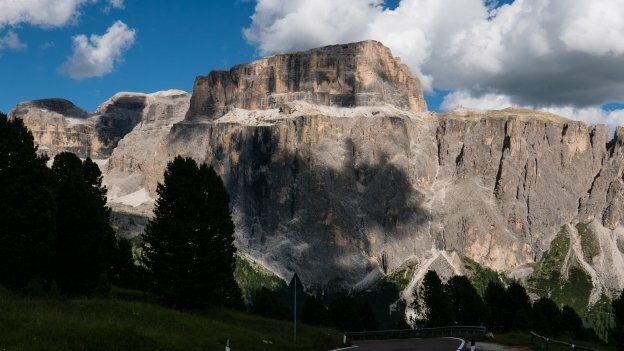 On the mini-climb, you can see the Gherdëina (Val Gardena/​Gröden) Stretching away into the distance. There is a fabulous view of the Saslonch (Sassolungo/​Langkofel) as you turn the corner and resume the descent. The road descends from the chalet down to a junction (1875m). 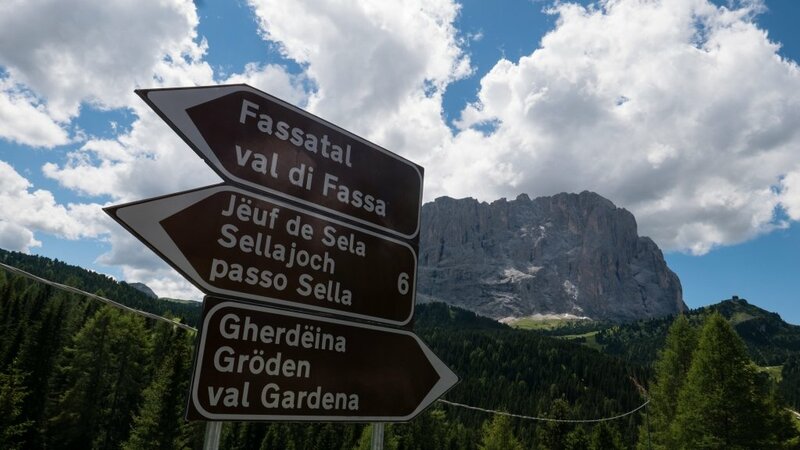 From here you can either continue into the Val Gardena or turn left for the Jëuf de Sela (Passo Sella/​Sellajoch). It's another glorious climb to the pass (altitude: 2244m). On one side the Sella group, the Saslonch (Sassolungo) on the other, and behind you, in the distance, the Puez group. 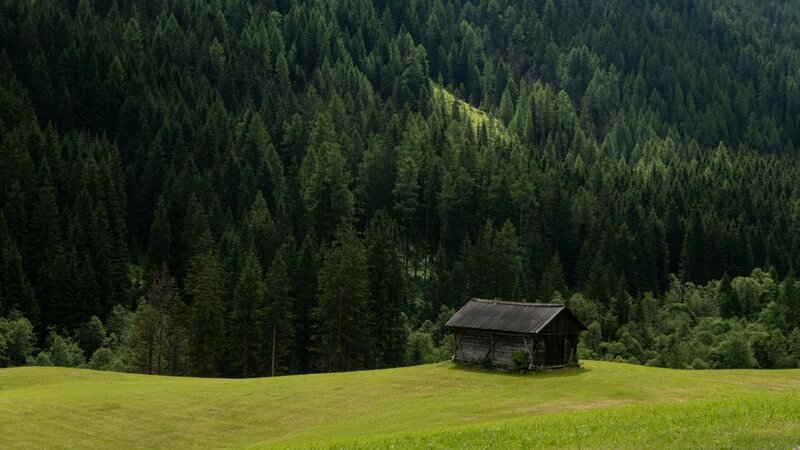 At the Jouf de Sela (Sellajoch/​Passo Sella ), you cross over into the neigh­bouring region of the Trentino. In the distance, you should be able to see the Marmolada glacier. If you're lucky, the sun should still be shining the face of the rocks. If you haven't had got a stiff neck already, you will have by the time you finish this section which is perhaps the most dramatic of all with the colossal walls of rock towering above you. On the way down into Cianacei (Canazei), you pass the junction with the road to the Passo Pordoi. From here you continue on the SS48. As you come into Cianacei, you go under the gondola and then back again. On the next hairpin carry straight on — this road takes you down into Cianacei's centro storico. Look out for the little church of Sèn Florian (San Floriano) with its fresco of Saint Florian casually emptying a bucket of water over a fire. Saint Florian is the patron saint of firefighters, and more generally of protection against fires, and you'll see pictures of him on houses (and fire stations) all over this part of the Alps. Even better than the little church is the La Floriana house on the other side of the road. The house is the work of local resident, and artist, Giancarlo Debertol. La Floriana is the star attraction, but you'll find plenty of other examples of murals around Canazei: the town is nothing if not colourful. Further on down the main road, as you head out of town, is the Sport Bernard shop (SR48/​Strèda Dolomites, 68) where there's a mural on the side of the building showing the months of the year in the Val di Fascia (Val di Fassa). 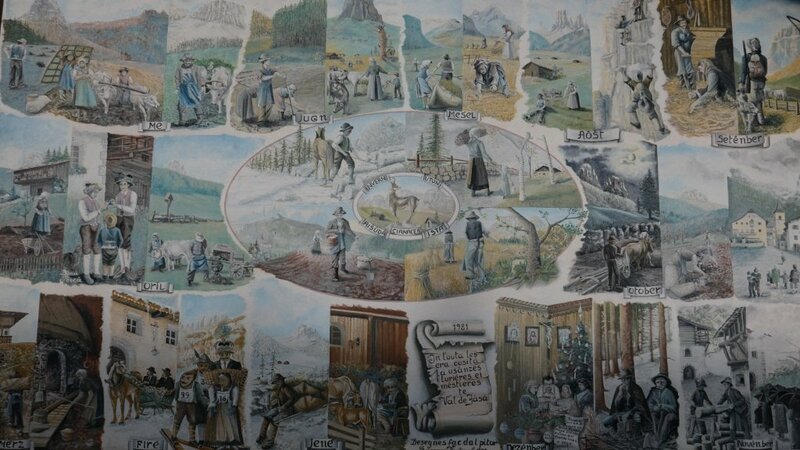 The murals aren't alpine fakery for the tourists (or maybe not just alpine fakery). In the 18th and 19th century people from villages across the Alps took to the road as itinerant artisans. Very often individual villages had their own speci­al­ities — ranging from knife sharpening to making and repairing umbrellas. 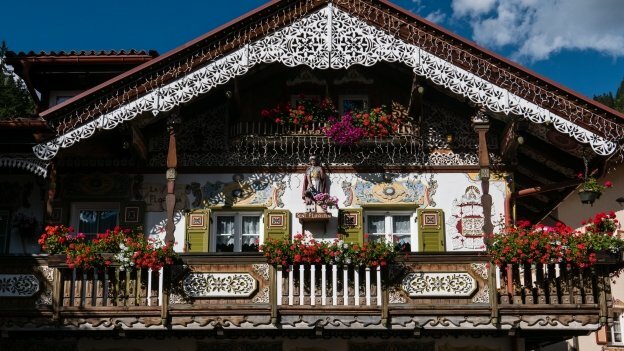 The speci­ality of the artisans from Cianacei was painting and decor­ating, and as they travelled and worked throughout the old Austro-Hungarian empire, they spread the decor­ative motifs that they had learnt at home. 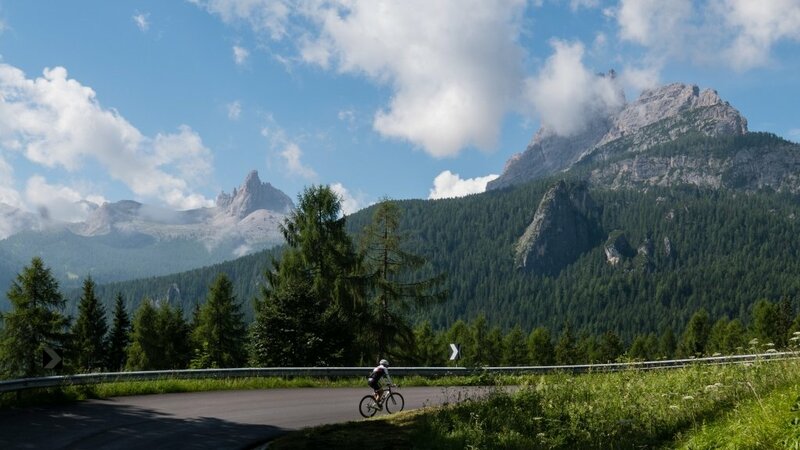 There are three more campsites along the next section of the route between Canazei and Pozza di Fassa, and a couple more that are within easy reach — see the campsites map for websites links etc. The nearest train stations are either at Bruneck (Brunico) to the north or the Etsch (Adige) valley to the west. So if you have a showstopper problem, you'll need to take a bus. According to Sudtirol Mobil some extra-urban buses can carry bikes in the baggage compartment. The website talks about single/​individual bikes (plural) so that might be one, or it might be two, depending on how much space there is. Unfortunately, the page isn't available in English but if you want to see it in either German or Italian then go to mobilitaaltoadige.info: limits for the transport of bikes. Similarly, in the Trentino, you can transport bikes on the 'extra-urban' coach services run by Trentino Trasporti. The number of bikes depends on the available space, but they say that on average there is enough space for two bikes. Also, some of the tourist shuttle bus services are equipped with racks for bikes. For more inform­ation see ttesercizio.it: trasporto biciclette. There are a number of shops that hire ski and snowboard equipment in winter and offer bike hire during the summer. It's not always easy to tell from their websites whether they offer assistance if you have a problem with a bike you haven't rented from them. fassa.com (it/​de/​en) is the tourist inform­ation website for the Val de Fascia and visittrentino.info (it/​en/​de/​pl/​cs/​ru) is the main tourist inform­ation site for the wider Trentino region.